The canvas room at Green and Stone is a bit of a misnomer, because in it you find much more than only canvas. Undoubtedly though, it is the product with greatest primacy, and as soon as you enter the room you will notice the shelves full of Belgian and French ready-made canvases, and the piled rolls, short and long, of cotton duck, linen, and jute, unprimed and primed – a collection which culminates in a room filled with the timeless perfume of linseed oil. The selection of canvases at Green and Stone is of great variety. 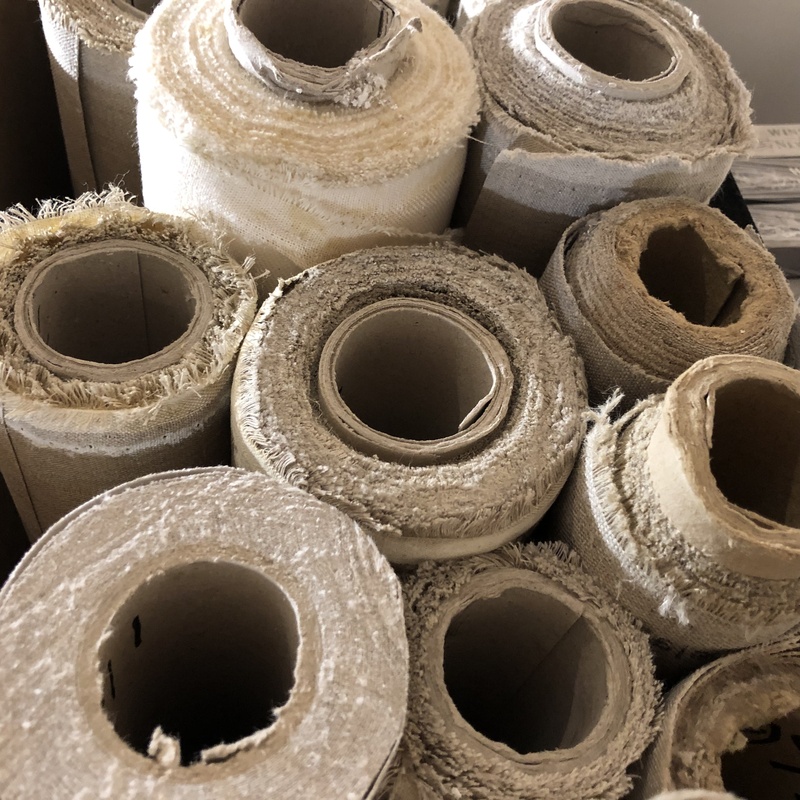 On the roll and sold by the metre we have eighteen different types including rustic and rough unprimed jute, 9oz and 12oz cotton duck, unprimed linen, all sorts of oil-primed and acrylic-primed linens ranging from the ultra-smooth double primed No.13, to the ruggedly grained Charvin. Tucked away nearby to our canvases is our selection of kiln-dried pine stretchers. These come in three widths, 2 ¼”, 1 ¾” and 1 ¼” and range in length from the dainty five incher to the eighty-four-inch corker, suitable for anything from the tiniest landscape to the grandest portrait. If a length you are after is not in stock, custom made stretchers are also available! In the middle of the room stands a collection of easels; travel easels, lyre easels, studio easels and table easels. Of the easels, the most exciting is the French box easel. The 19th century invention is a work of sheer genius akin only to nuclear fusion. Essentially, it is an inclinable easel attached to a box which itself is placed upon retractable legs. Truly, it is Heaven sent! Whilst primarily used by the plein air artist it is also very suitable for an artist with a limited work space. With its nifty design it can hold both small and large canvases whilst also containing all of your brushes and paints. When you are finished in the field, sufficiently sunburnt and tired of the painting that was intended to relax you, the easel neatly folds down to a box. Some people complain the French easel is too complicated to set up and take down, but I regard it as a satisfying challenge, and when returned to its cuboid form its physical solidity can help reaffirm the artists’ fragile sense of self – and frankly, no other easel so excellently holds a canvas, all of your paints, a palette, remains sturdy and rigid whilst out in the field, and is very camper-chic. The French box easel thankfully comes in two sizes, one full, one half, with the half being an elongated box, so there is simply no reason for you not to have one. If however, you prefer the idea of a simpler, less all-encompassing easel – perhaps, because unlike me you cannot face the challenge! – there are various others in the canvas room to select from. These include lightweight watercolour easels weighing as little as a kilo or the multipurpose and supremely well-priced St Paul’s sketching easel. This easel – for some reason named after Paul the Apostle (if anyone has an answer please email answers4ned@gmail.com) is easy to set up, comfortable to carry, comes with a sartorial strap, and though less solid and comprehensive is cheap, cheap, cheap! If you are blessed to be able to splash a little more cash the Mabef (Made in Italy) sketching easel is a larger and hardier equivalent able to take bigger canvases. For the student there are also various H and A frame studio easels, or for the established artist there are our exquisite and grand French-made oak studio easels. Amongst the new, there are also the old, and so in the canvas room there is also an ever changing collection of antique easels. Adding colour to the canvas room is the card stand which not only includes a rainbow range of thirty delighting shades of Canford Card, but also glittery, shimmery, and pretty craft card. Similarly, our mountboard comes in such a dazzle of colours your mood board plans might be thrown into the air. If you are one of these interior designers who like to use mood boards, you then only need to turn your head to also see our foam board and portfolios. The room is filled with all sorts of folios suited to presenting all your fabulous work to friends and clients. These folios include very smart black numbers, and more funky retro portfolios with jazzy faux marbled covers. There is much more in the canvas room; trestle tables, porte cartons, and all sorts of artists’ materials and equipment including ready-made gesso, rabbit skin glue (in flake or jelly form), marble dust, whiting, carrageen moss, staples, and much, much more. The truth is, words cannot do the room justice. So come and see it for yourself!